When Louise Simon Schoene enrolled in Buffalo State’s multidisciplinary graduate program, she aimed to improve her volunteer skills. Those skills, after all, are what the longtime West Seneca, New York, resident and former stockbroker use to promote the numerous causes and charities she champions. Now that’s she nearing the end of her program, combining public relations and creative studies, Schoene has far exceeded her initial goal. She dedicated more than a year to organizing a three-generational exhibition of Burchfield family art that opened April 30 at the Kenan Center in Lockport, New York. 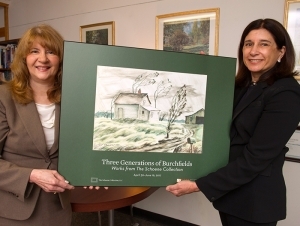 She orchestrated Three Generations of Burchfields: Works from the Schoene Collection in conjunction with the community institution’s 50th anniversary celebration. The show runs through June 16 and features 83 watercolors, drawings, studies, wallpaper, and doodles created by American watercolorist Charles E. Burchfield, his daughters, Catherine Burchfield Parker and Martha Burchfield Richter, and his granddaughter, Peggy Richter Haug. Buffalo State design lecturer Gerald Mead serves as guest curator. It was a timely and significant show because the Kenan Center House Gallery’s inaugural exhibition featured Charles Burchfield paintings. Schoene’s interest in Burchfield’s art began soon after she moved to West Seneca and learned of the town’s famous resident. What really captivated Schoene was Martha Burchfield Richter, an award-winning artist who exhibited frequently. She was one of the seven founders of Buffalo State’s Burchfield Penney Art Center. Richter also suffered from depression and committed suicide in 1977. After her death, her work was never exhibited again. In Schoene’s Creative Problem Solving course, chair and associate professor of creativity Gerald Puccio and associate professor John Cabra asked students to choose a personal problem to tackle. Schoene quickly identified her problem: Finding a way to return Richter to the public eye. 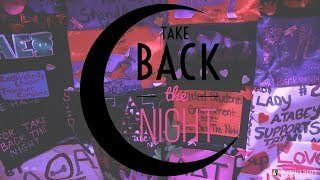 She continued the undertaking as her final project under the advisement of Deb Silverman, associate professor of communication and coordinator of the master’s in public relations program. Thus, the Kenan Center exhibition was born. Schoene, who is slated to receive her master’s degree in 2018, recently donated two Burchfield posters to the Communication and the Creativity departments as thanks for the direction she received. “Without Buffalo State, I never would have had the experience to achieve what I’ve done so far,” said Schoene. Along with the exhibition, Schoene’s accomplishments include attracting a 22,000-plus Facebook fan base for Richter, acquiring a copyright of her art, producing five limited-edition giclée prints, and arranging for Richter’s art to be included in Marshall, a bio-pic about Thurgood Marshall that was filmed in Buffalo in summer 2016. Schoene has myriad plans to continue showcasing Richter’s art on a broader scale, including releasing a set of notecards featuring six of her paintings, writing a book about Richter to be published by Heritage Press, and creating a traveling exhibition of the three-generation. Learn more at her website.